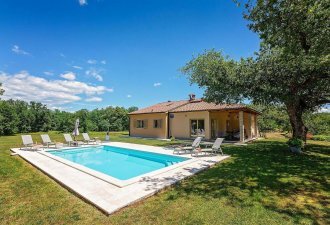 Villa Leda is a lovely newly built villa with pool located at the edge of a nice forest by the village Belavici in southern Istria. The house has been built in the year 2015, it is spacious and comfortable offering to its guests a really relaxing and quiet holiday. On its enclosed property of 650 sqm villa Leda offers to its guests the following outdoor facilities - a 24 sqm large swimming pool with sunbeds and outdoor shower, spacious covered terrace with dining table, barbecue and parking places for two cars. Villa Leda is for 4-6 persons and has a living area of 120 sqm. It consists of a large living space with modern kitchen with appliances, dining table for 6 persons and living area with sleeping couch for one person and fireplace, one shower/toilet in the corridor with a small pantry with washing machine, two two-persons` bedrooms wih double bed, satellite TV, air-condition and ensuite bathroom/toilet. One of the bedrooms has an additional bed and a bathtub with hydromassage. NOTE: The pool can be used in the period 01.05.-15.10.